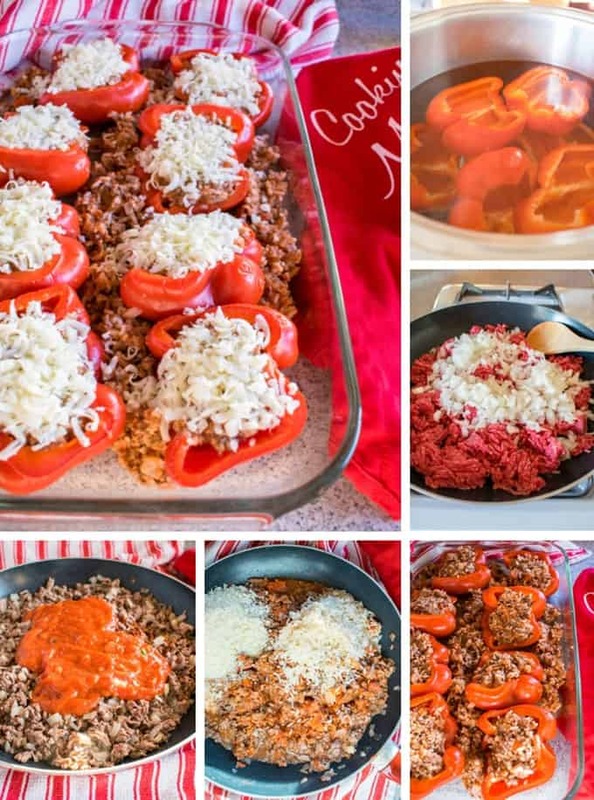 My Italian Stuffed Peppers feature ground beef, rice and onions with marinara, Pecorino Romano, mozzarella and basil! Forget boring and bland — these are incredible! Let’s cut to the chase. I mean the cheese. Deciding to use my Homemade Marinara Sauce was game changing. So was adding Pecorino Romano instead of Parmesan. Talk about a huge flavor kick! Of course, I had to sprinkle on more mozzarella and ribbons of fresh basil. I’m getting excited just thinking about it, because I get to eat the leftovers for dinner. I’d better chillax and give you the details. First, here are my recommendations to make this recipe go faster. Start with cooked rice. Whenever I need rice, I always make extra and freeze the leftovers…it’s a beautiful thing to have on hand for recipes like this, when you just need one cup of cooked rice. Have your marinara sauce already made. Again, it’s so helpful to make extra batches of sauce and freeze them in quart containers. 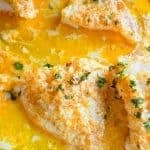 You’ll need a quart of sauce for this recipe. With those two ingredients out of the way, cut your peppers in half and clean out the seeds and membranes. Boil the pepper halves for three minutes and let them drain while you prepare your meat filling. Brown your ground beef with chopped onions, stir in some sauce, rice and Romano, then stuff those peppers! 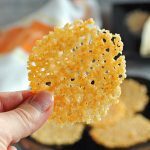 I like to use my tablespoon scoop (affiliate link) to make it easier. 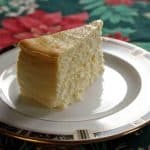 You’ll have some extra filling (so sad!) Nestle it around your peppers in the pan. Next, you’ll top your stuffed peppers with mozzarella and bake for 15 minutes. 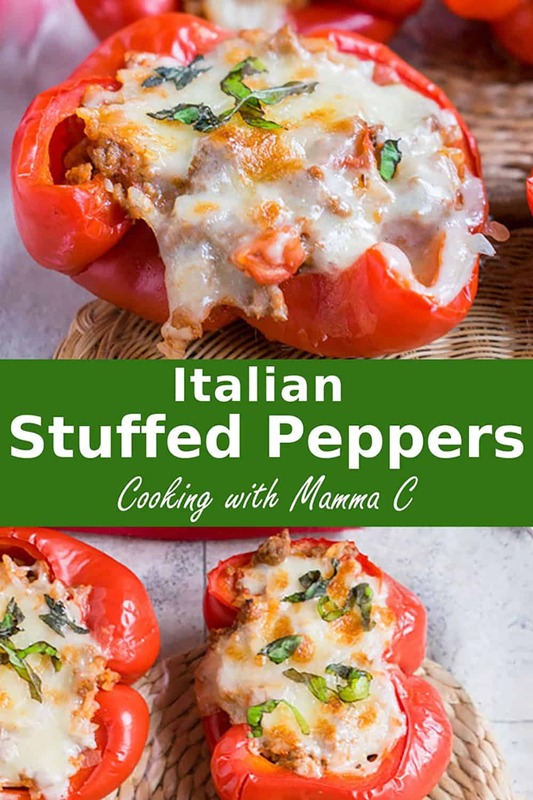 And, it’s not mandatory, but I recommend you broil those Italian Stuffed Peppers for two minutes to get some gorgeous browning on the surface of that melted cheese. Serve the stuffed peppers with more marinara sauce spooned on top. Extra Pecorino is nice, but not necessary. 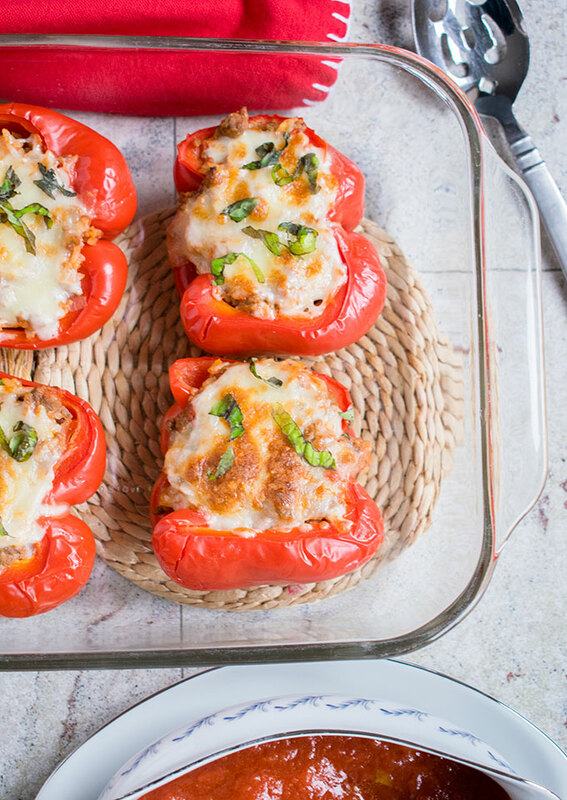 These stuffed peppers make a complete meal and are so filling! I can eat one half, plus half of another half, maximum. But I like to serve them with The Best Italian Green Salad with Homemade Dressing. It rounds out the perfect dinner. 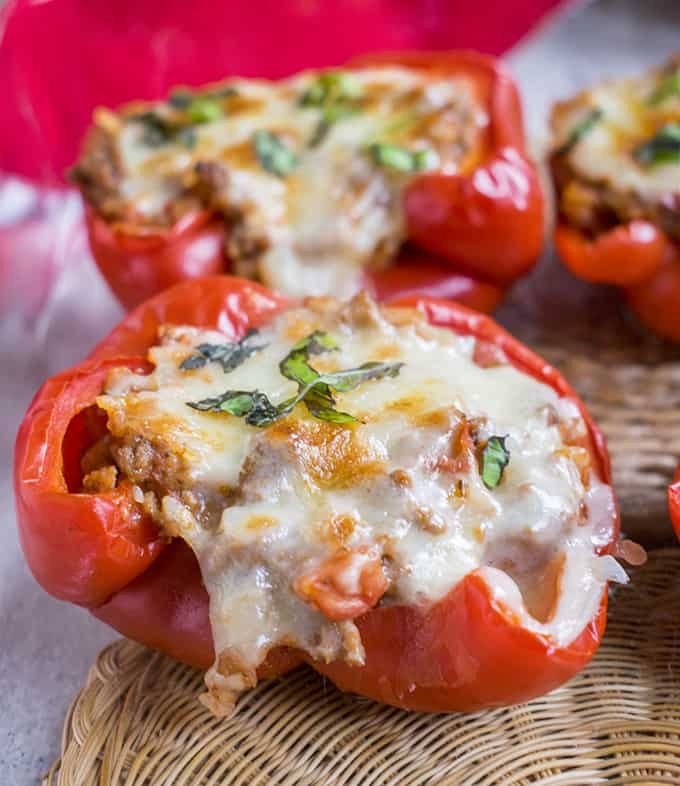 My Italian Stuffed Peppers feature ground meat, rice and onions with marinara, Pecorino Romano, mozzarella and basil. They're incredible! Note, you'll need marinara and cooked rice to start. Fill a 6-quart pot 2/3 full with hot water. Place over high heat on the stove and cover. Rinse your peppers and pat them dry. Cut out the stems and slice each pepper in half. Scrape out the seeds and membranes and discard them. When your water is boiling, carefully place the pepper halves in the pot. Boil the peppers for three minutes. Carefully drain the peppers in a colander in the sink. Use tongs to turn the peppers so the cut sides face down, allowing the water to drain out of them. Let them sit in the colander as you make your meat filling. Peel your onion and chop it. Preheat your oven to 375 degrees F. Grate your Pecorino and shred your mozzarella, if needed. Add your ground beef to a 12-inch skillet on the stove over medium-high heat. Break up the meat with a wooden spoon. After a minute, stir in the chopped onions, red pepper flakes and salt. Cook, stirring frequently, until the meat is browned and the onions are tender. If your meat is lean enough (90%) you shouldn't have to drain any fat. If you have lots of liquid, drain most of it. Stir in 1 1/2 cups of marinara sauce to the meat mixture. Stir in the rice (if it was frozen, thaw it in the microwave first.) Add the Pecorino Romano and stir to combine. Cook the mixture for a couple minutes, or until it's heated through. Prepare a half sheet pan or a 10x15 baking pan for the peppers. If using a sheet pan, line it with foil and grease it with cooking spray. If using a 10x15 pan, just grease it with spray. Add your drained pepper halves to your baking pan, cut side up. Scoop about three tablespoons of the meat filling into each pepper half. Add more meat as needed, until each pepper half is filled to the surface. Scatter any extra meat filling around the peppers in your pan. Sprinkle each pepper half with two tablespoons of shredded mozzarella. Gently pat the cheese onto the peppers. Bake, uncovered, for 15 minutes at 375 degrees F. Then, broil the peppers for two minutes to brown the cheese, if desired. While the peppers are baking, gently rinse your basil leaves and pat them dry. Stack a few leaves, roll them up, and slice them into ribbons. 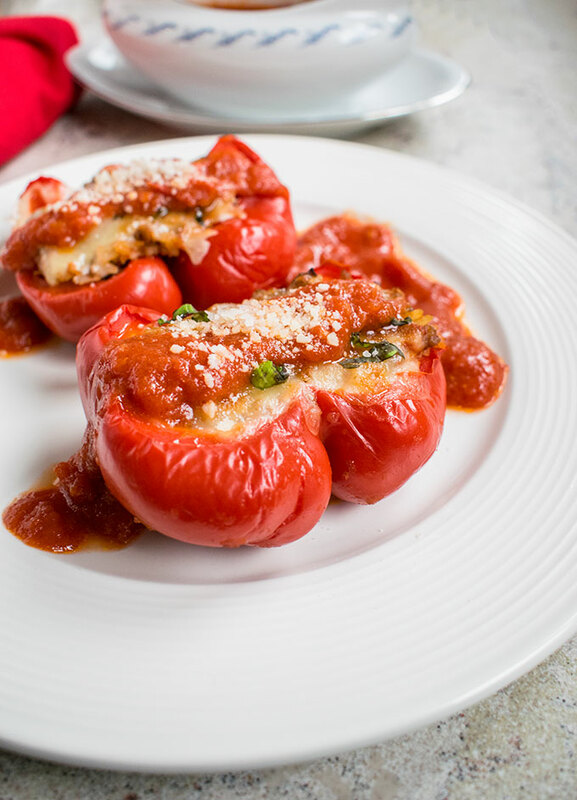 When the stuffed peppers are done, sprinkle the basil on top and serve with extra marinara sauce. 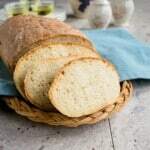 Refrigerate leftovers for up to four days. Recipe time does not include making the marinara sauce or rice. I recommend making these stuffed peppers when you have leftover rice and sauce; otherwise, add 20 minutes to the recipe time. Typically I do Mexican style fillings but these look great! Mexican would be great too! Thanks, Matt. These look fantastic! Incredible flavors going on for sure! Thanks, Taylor! We inhaled them! It’s been way too long since I’ve had stuffed peppers! Putting these on the menu! They really hit the spot, Pam. Enjoy! 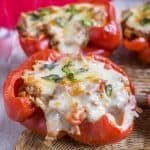 Huge fan of stuffed peppers here and your recipe is on point! Keeping frozen cooked rice available is genius for making this a quick and easy dish. Ditto for the marinara! Next time, invite me over! I’d love to invite you over! 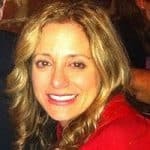 Thanks, Lisa! I love stuffed peppers but I haven’t made them in so long! These look awesome! Thanks, Liz! They’re our new favorite meal.